It's a familiar story: In search of love, a youngster sets off on an ambitious, risky, and unpredictable quest into the unknown. But when that youngster is an adolescent mountain lion departing from the Black Hills of South Dakota and heading east, the outcome is known—and it's a fatal ending. For the subject of wildlife expert William Stolzenburg's new book "Heart of a Lion: A Lone Cat's Walk Across America," that ending comes in the form of an SUV driving down a Connecticut parkway just 70 miles from New York City and 2,000 miles from where the young cougar began his journey. While in recent years dozens, if not more, of these stranded South Dakotan lions have taken stock of their surroundings and opted to venture into the great eastern beyond, Stolzenburg documents the most impressive and heartbreaking of these journeys on record. Departing in 2009, the one-year-old, 140-pound mountain lion stealthily crossed more than half a country of inhospitable terrain over the course of two years, much of which hasn't seen more than a handful of mountain lions since the 1800s. Why take on such an inauspicious journey? In search of a mate (of which there are none in the eastern United States as far as we know) and some territory of his own. If only someone could explain to these lions that what they find in a world criss-crossed with highways and checkered with suburbs will inevitably be worse than the struggle they face back home—although they may both end in the same manner with an early death. But that would go against millions of years of evolutionary breeding anyways, a subject Stolzenburg delves into between chapters tracking the lion. He explores the history of mountains lions in North America, and how they managed to survive for millions of years alongside larger megafauna and thousands of years alongside humans before being hunted to near extinction in the 20th century. Their ability to leap great distances and scale trees, a qualities not possessed by most big cats or other large predators such as bears, was of great benefit. What eventually amounted to the farthest land-bound trek ever recorded for a wild animal in America started in the hills of South Dakota's western border. At the time Stolzenburg's cougar flees the den and heads towards Minneapolis in 2009, there were potentially more than 200 lions living in the hills. As recently as 30 years before, their existence in the region had only been rumored. Western settlers had hunted the so-called vermin out of the area before hunting seasons and other conservation measures were eventually put in place in the 1960s. By 2009, however, hunters and ranchers had convinced authorities that, against all evidence, the lions were a safety hazard and needed to be culled. Now dozens of them were being killed every year even as conservationists presented scientific studies showing that the killings disrupted the lions' natural order and made violent encounters with humans and livestock more likely. He was little more than a year old and not long separated from his mother. He had survived his first year as hunters' quarry, public enemy, and roadkill candidate, dodging the armed sportsmen and police and the vehicular predators speeding through the heavily traveled hills. He had dodged his own kind as well. Had any of the Hill's reigning males caught him trespassing, they might well have killed him. The young tom had reached a leap point in the life of male lions. He was a teenager toeing the line of adulthood, heeding a hard-wired imperative to find a mate and a place of his own. In weaving together details of the lion's journey—barns where he slept, urban camera traps that he set off, deer carcasses that he left behind—with tales of people, modern-day and historical, that have fought for or against lion and broader wildlife conservation, Stolzenburg illustrates an America far removed from its wild roots and grappling with the reality of hanging on to any of these increasingly remote features of life. In one of the most potent passages in the book, Stolzenburg portrays the killing of another young lion in Chicago, known as the Milton lion. After creating a name for himself during the journey east from South Dakota, the cougar enters Illinois as only the third lion to be spotted in the state in the last 150 years. Shortly thereafter, he's seen yards from the Linden Avenue terminus of the Chicago L, the third-busiest mass transit rail in the United States according to the book. After police start receiving calls from anxious residents … well, you can guess what happened next. The lion was shot dead in an alleyway, it's body pierced by at least six bullets. Urban cops are not trained for such encounters and bystanders could definitely have been in harm's way. People saw both points of view in the unfortunate encounter, and the public went into a "catfight" over the shooting of the cougar. As Stolzenburg sees it, for those who understood the large cat's "true intent, he was a bracing reminder of the towering barriers still standing between a lion simply looking to find a mate, and a society seeded with people simply wanting him dead." As one proponent of mountain lion conservation puts it, "simply showing up gets them shot." Stolzenburg doesn't argue that mountain lions should be allowed to roam free at any expense, but rather points out how a science-based management system could benefit everyone. He wants to limit unplanned human encounters while also allowing the lions to play their natural role in certain ecosystems. For instance, cougars can help keep deer and rabbit populations in check, animals that can overrun forest vegetation when let run wild. This is an ongoing problem in a wild mostly devoid of large predators, with recent research showing how these animals actually do a lot to help keep ecosystems in balance. 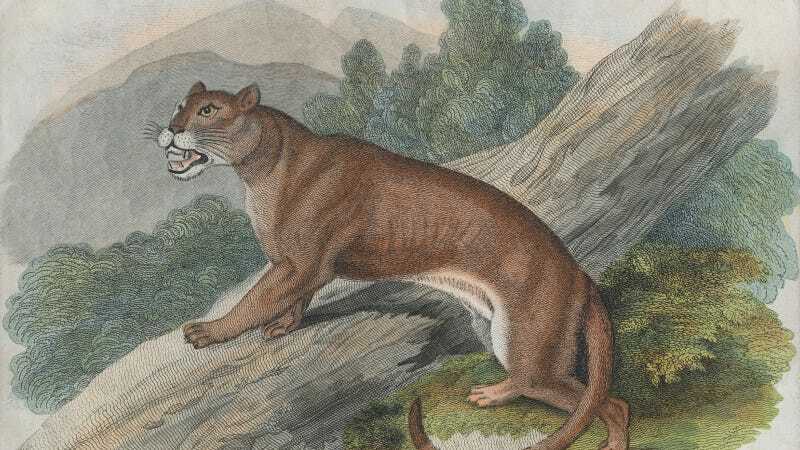 In many cases these mountain lion encounters are quite complex, thrusting the relationship between humanity and nature under the microscope of modern society. Take for example the recent case of the celebrity mountain lion that's found a way to live in the hills of Los Angeles (You've seen the picture of a mountain lion under the Hollywood sign?). This lion is now believed to have snuck into the L.A. Zoo and killed a koala. Who should we sympathize with—the wild cougar looking for its next meal or the captive koala, 10,000 miles from home? Probably both. For now in California, where there are around 5,000 mountain lions, hunting them remains illegal. But with enough incidents like the one with the koala, even an avowedly eco-friendly state could turn against the cougars. And without enough humans fighting for them they'd have a much harder time surviving in the world we've created.